Comfortable, wooden holiday home above the Tarn river with a spacious surrounding garden. 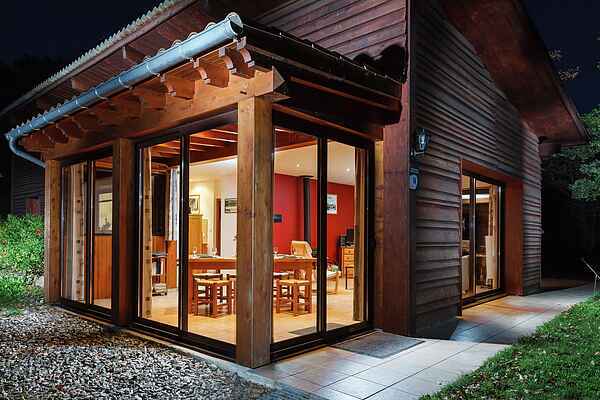 The 5 large sliding doors will give you the feeling that you are living outdoors! From the sunny terrace you can enjoy the quiet atmosphere while the children can feed the horses and goats at the lower situated meadow or entertain themselves in the shared, heated pool. There is also plenty to experience in terms of culture. If you like to enjoy beautiful natural scenery you can go for some lovely walks straight out from the house. There two mountain bikes at your disposal and you might like to cycle to Broquiès (10 km), where you can hire a canoe and follow the river downstream. You will find a bakery, a supermarket, bank and market in Réquista (9 km). There is a restaurant in Brousse-le-Château (8 km). And there is a beach on the river Tarn at Connac (3 km). A short drive towards the East will bring you to the caves at Roquefort (40 km). Inside these caves is the only place where the famous Rocquefort cheese is ripened. And your holiday would not be complete without paying a visit to the charming town of Albi (60 km). The most prominent sight to visit is the Cathédrale Sainte-Cécile. The construction of this brick-built edifice took over 100 years.